Trust Google to keep up with the times. Many years ago, Google searched through text; you typed in a query, and it threw a result at you. Then it added voice – you could merely speak into your phone, and Google would dutifully send you a result. Now Google’s speaking the language of the people again – it’s letting users search via emoji. Google’s Twitter account is now letting people throw emoji at it, and it returns a useful result. Google seems to be using this feature to show off its nearby feature – the results are tailored according to the user’s location. 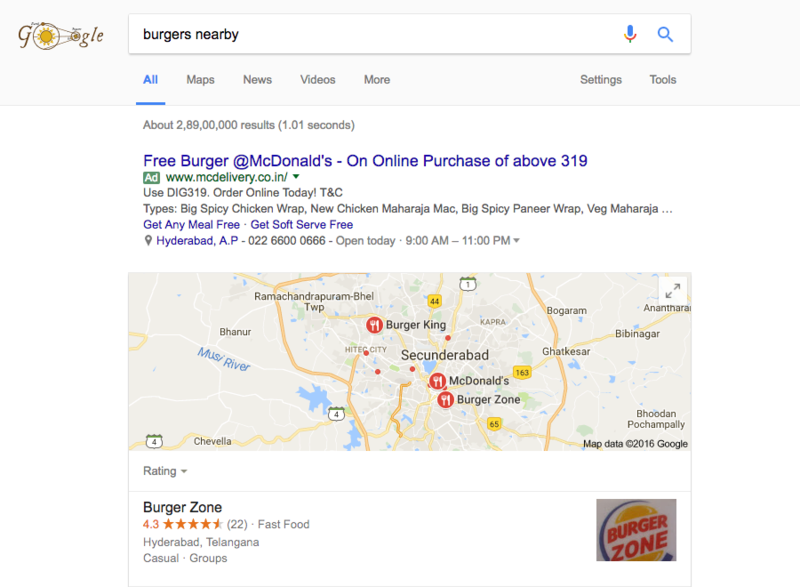 For instance, we tried tweeting a burger emoji at Google, and moments later, it returned a gif overflowing with burgers, along with a link of burger joints near our area. Similarly, tweeting an apple searches for supermarkets nearby, and tweeting a wine glass emoji directs you to the bars in the area. Now all this is pretty cool, but it’s not hard to imagine how all this works. Google’s mapped emoji to specific searches, and throws up appropriate results. What’s more interesting is Google seems to automatically pick up your location. We tried searching on desktop, on incognito, and it still perfectly picked up where we were. The feature, sadly, doesn’t seem to work with all emoji – sending an emoji of french fries returned a “emoji under construction” message – but it’s an undeniably cool addition. Google’s a bit of a old horse in the tech world – it recently turned 18, which makes it something like an octogenarian in human years. And it’s nice to see it still speaking the language of the cool kids.